Barns have a special place in Amish society, with its agricultural traditions and communal custom of barn-raising. The red-painted barn is symbolic of Amish culture and the people’s long-standing ties to the land. 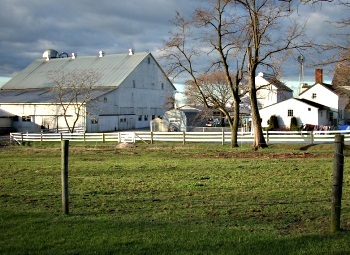 In recent years, however, the term “Amish barns” has come to signify not just the full-scale buildings key to the Amish farmer’s livelihood, but smaller structures including mini-barns and storage barns more and more frequently seen in American residential locations including suburban backyards. Amish manufacturers build barns in large communities including Lancaster County, PA and Holmes County, OH and retail their products in dozens of locations across the nation via Amish barn dealers. Amish craftsmen also build structures like horse barns and stall barns, as well as doing historic barn restoration. Use the guide below to find an Amish barn business in your location. California’s first Amish outdoor structures supplier, owned by Lancaster-County raised Nathan Martin and family. Backyard Unlimited carries a vast array of products including horse barns. This business specializes in quality constructions such as pole buildings, custom-framed homes, garages, additions, horse and alpaca barns, barn painting, and more. Service provided by skilled Amish crew. Offers a broad choice of Amish hand-built outdoors structures including sheds, gazebos and horse barns. Each building can be customized to buyer specifications. Delaware supplier for Amish-built outdoor structures including horse barns. Features a wide choice of Amish built furniture and outdoor items. Mini-barns, Dutch barns, Amish hand built horse-barns in various models available. Harrington Self Storage structures come in a variety of options. A wide choice of wood and vinyl barn styles including basic Dutch, Gable, Cottage, Quaker, Manor, Salt box, and Candyland. All Amish structures are made from solid wood and vinyl materials and can be customized to any needs. Features a broad choice of outdoor buildings including mini-barns. All products are Amish hand-crafted. Provides quality portable buildings made by skilled Amish craftsmen. Amish built storage lofted barns feature 65% more storage space, to keep valuables elevated in a dry place. Carries a vast selection of Amish and Mennonite made outdoor structures. Some of the barn models include regular barn designed for long-time storage use, utility barn with high side walls for extra storage shelves, (in both treated wood and metal), lofted barns with optional windows, shutters, and flower boxes (in your choice of colors). Go to Amish Barns Indiana main directory. View the full Amish Barns Kentucky listings. Dealer of Amish-built horse barns. Also sells other outdoor storage buildings and structures. Four Maine locations. View the Amish Barns Maryland directory. Features a big choice of outdoor Amish structures including barns. Hand-built barns come in a variety of models including the board and batten horse barn, stall barn, board and batten/vinyl backyard Dutch barns with different door options and mini-barns. Michigan supplier for a broad selection of Amish handcrafted outdoor structures. Some styles of barns available. Features Amish-built quality outdoor items such as barns, cabins, sheds, lofted garages and much more. Barns come in a variety of options including metal or shingle roofing in a range of colors to choose from. Carries some Amish custom-built barns. Classic Buildings specializes in numerous Amish-crafted structures, including storage barns (lofted barns, country barns, mini barns, lofted garden barns). Other products include garages, storage sheds, studios and cabins. Standard features include pressure-treated skids, air vents on gable ends, heavy-duty hinges, and working loft doors. Eleven points of sale in Missouri and one in Illinois. Features Amish quality outdoor structures such as gazebos, garages, sheds, outdoor furniture and more. 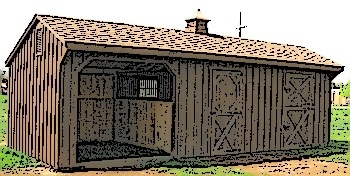 Amish-built horse barns come in a variety of styles and options including the horse barn with optional cupola and weather vane, stall barns, modular barns and run-in sheds. A family-owned business, carrying a range of outdoor structures made by skilled Amish builders. Barns come in a few different styles, made from solid materials. Offers Amish quality built indoor and outdoor items. Amish-built barns available in a variety of styles such as Quaker, run-in, cottage horse barns and specialty horse barns. Unique features on Amish-built barns include grill with hay rack and feed hole, gable vents, chew guards, vapor proof lights and more. The Amish barn is a mainstay of farm life. Some Amish do restoration of old barns. Go to the Amish Barns New York directory. Carries a broad selection of hand-built barns created by Pennsylvania Amish craftsmen. A range of options to choose from such as wood/vinyl/cedar appearance, method of delivery (assembled, built on site, crane lift), shape and size, trim and shingle colors, door and windows styles and more. View the full Amish Barns Ohio directory. Go to the Amish Barns Pennsylvania main directory. Yard and Farm carries a variety of Amish hand-made products including some styles of barns such as Quaker, storage, horse barns, cottage, yard barns and mini barns. A number of building options available. Hilltop is a Beachy Mennonite Amish family-owned business. They carry a vast array of outdoor structures such as sheds, garages, cabins, horse barns, chicken coops and log furniture. Small horse barns come in various options including dutch doors, cupolas, overhang in front of the barns, a variety of stain colors and more. A construction company with an Amish Mennonite crew. They built homes, cabins, horse barns, fences, brick/bloc/stone masonry, framing and roofing works and more. Carries a vast selection of Amish structures such as gazebos, sheds and barns. Carriage Shed specializes in Amish hand-made outdoor buildings. They provide some styles of barns including prefab barns, modular barns and custom barns. They set up barns anywhere in the United States. View the Amish Barns Virginia main listings page. Ottawa-area supplier for Amish made horse barns. Safe, custom built, durable and quiet horse barns in a broad choice of building options. Styles include the high country horse barn, monitor, modular, shed row horse barns and more. Please check hours of operation of Amish cabin retailers listed above. Business locations and hours change. Amish-owned businesses are closed on Sundays as a rule. Non-Amish barn dealers may be open. Not responsible for any changes to the above information. I am in need of a small horse barn, with 2 stalls and some hay storage. Can you possibly connect me with any Amish barn builders in Mid-coast or central Maine? Thank you sincerely, for your assistance. Grace, Hillview Mini Barns is a dealer for Amish-made horse barns with 4 locations in Maine (Etna, Lyman, Sabattus, and Holden). We just added this info above, or see hillviewminibarns.com for more. The only Maine Amish communities in the area you describe is near Unity as you mention. The other 4 Maine communities are in the north in Aroostook County. We service the tri-state area of Ohio/Wv & Ky. Free on-site inspections and estimates. We also do construction- garages, pole barns, cabins and outbuildings.